Mundra International Container Terminal aims to provide high standard of services and facilities to all the terminal users and is supported by a dynamic team, state of the art equipment and a passion to excel. The Mundra International Container Terminal Private Limited (MICT) is one of the most sophisticated and technically advanced port facilities in the Indian Subcontinent. Strategically located at Mundra port in the State of Gujarat, it is the closest gateway to the largest cargo generating regions of North and Northwest India, with an ability to handle some of the deepest container vessels to today. Being in operation since 2003 MICT has made tremendous progress because of its world-class service and customer focus. 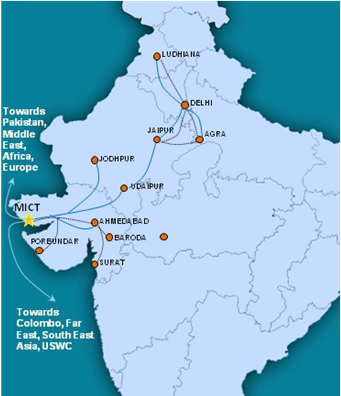 MICT, located at Mundra in Gujarat, is the largest container terminal on the West Coast of India. Currently the Terminal has a quay line of 632 metres with a depth of 13.5m CD alongside and a short channel of only 1.1 km. Depth in the channel is 13.5m CD. The Terminal operates 24 hours a day, seven days a week and 365 days a year and has no tidal restrictions. MICT also operates a Container Freight Station which works round the clock. Cargo is handled with specialised equipment and trained staff with tight security. The CFS presently has a covered warehouse space of 18,420 sq m, with a open container storage yard of 15.741 hectare. MICT is confident of meeting your logistics requirements as a professional operator. This is done with complete cost transparency, there being no additional hidden expenses towards measurement, cargo survey and levies.